It is not news that the Internet has skyrocketed as a tool for buying and selling homes in the past decade. 80% of buyers now use the web as a search tool. 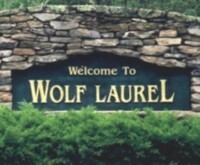 In resort home markets, such as Wolf Laurel, where buyers are likely to be shopping from remote primary residences, the numbers are even higher. This development has helped to launch a bevy of venture capital supported, web based valuation sites. These portals all make claims for buyers and sellers which roughly equate to the ability to find a "home's true value". My summary position on this would be a simple "user beware", or to use the Latin, caveat criminator. USA Today recently, (02/09/07), reviewed 10 such sites in an article here. Certainly, scroll down for the site by site analysis, but there are a couple of of general conclusions that can be quickly observed and logged into memory which cast doubt on the claim of "true value". First, It is a gigantic task for these portal sites to maintain a database that comes close to getting the user any kind of a real value on their own home, or market values in general. This is especially true in a resort micro market such as Wolf Laurel. As I browsed the sites myself, I often encountered trouble finding homes in our zip code. I was unable to find even my own home in listings, let alone comparable homes within our subdivision. In short, no site can hope to maintain a database that is adequate to measure a home's "true value". The real danger said Appraisal Institute president Richard Powers, "... is that someone will make a real estate decision based on the site rather than getting someone to perform an actual appraisal. A free Internet valuation might be adequate if you want a quick estimate, but when making decisions about your largest investment, there is no substitute for an appraisal." USA Today noted a 35% to 99% range in accuracy in some cases, while Perkins points out a range in valuation of +/- $349,000 on a subject house in California. Bottom line is that buyers and sellers should talk to a realtor from the area in order to truly have any data. Soundslike a commercial, but is true nonetheless. The second problem with these sites appears to stem from the kinds of partnerships involved. Corporations such as E-Loan, Keller-Williams, and a list of the usual big money real estate suspects favor their own data/listings, and in a number of cases require registration in order to see results, or even photo galleries. One wonders what purposes the registration information might serve. AOL Real Estate:Cumbersome search which turned up 369 properties with "waterfront" as my criteria. This is not possible in a mountain county ranging from 1400' to 5500' above sea level. I was unable to refine the search to "Wolf Laurel" after a reasonable number of attempts. Homes dot Com:Returned only 6 homes for sale in this zip code, there are 35 at the moment in this subdivision alone. HomeGain:I had to go about 5 pages inside the site to even get the function to search Mars Hill, NC, and the results had a mere 22 listings. There are 354 properties in your area. At least 84 matched your criteria. I tried to view photos on a home nearby and was asked to register, just to see them. I declined, as I imagine more than 90% of users would do. Buyers wish to retain their identities until they are good and ready to do otherwise. Zillow:Returned only 51 results for this zip code, far from adequate. Zip Realty dot Com:Brought me several pages inside before my search could begin, and when I clcicked on NC, I was transported HERE, to HomeGain! There is obviously a good amount of money being thrown at these kinds of valuation start ups. One needs to look no farther than national television advertisements to see this. However, money does not ensure the kind of accuracy that buyers or sellers could get from, well, someone who is actually there. Please feel free to visit us at The Black Bear Realty Home Page. We should make sure the real estates we are buying online are reliable and worth the price.